While the focus of Monday’s WWDC keynote was on Apple's two operating systems, iCloud was a strong supporting player. That’s because, if iOS 8 and OS X Yosemite will represent the two sides of an Oreo cookie, then iCloud will be the creamy filling that keeps them glued together. Among other things, Apple demoed a number of new features in both iOS and OS X under the general heading of “Continuity”—ways that Macs and iOS devices will be able to work together to offer new services, in many cases using iCloud as the link. Here’s everything you need to know about the new connection services coming to Apple devices this fall. Let's cut to the chase: How much online storage will I get for free? How much will it cost if I want more storage? Cheap-cheap, as the bird says. For just $1 a month, you’ll get 20GB. (It’s unclear if that is on top of the existing 5GB or including it.) Jack that up to $4 per month and you’ll get 200GB. As a point of comparison, that $48 a year is just slightly more than the $40 a year you currently pay for 20GB. Apple says it will have tiers all the way up to 1TB of storage. How do iCloud's new pricing/capacity options compare to, say, Dropbox? Pretty favorably, actually. Dropbox gives you 2GB free when you sign up, and though it does offer you additional ways to pick up extra space (uploading photos, for example, or referring other users), the service’s next paid tier is 100GB for $10 per month (or $100 per year if you prepay). 200GB costs you $20 per month (or $200 per year), and 500GB is $50 per month (or $500 per year). By comparison, Microsoft’s OneDrive offers 7GB free, with up to 8GB extra for uploading photos or referring users; paid plans come in at 50GB extra for $25 per year, 100GB extra for $50 per year, or 200GB extra for $100 per year. Meanwhile, Google Drive hands out 15GB free, with 100GB for $2 per month or a terabyte for $10 per month. When will those new iCloud prices go into effect? Apple hasn't given us a precise launch date, but we're presuming it'll be in the fall, when the new operating systems are released. iCloud Drive will be a unified file-system bridging OS X and iOS. Will I be able to share files in my iCloud Drive with other people? Well, it depends on your definition of the word “share.” You’ll probably be able to do the same sorts of things with those files that you can now—send them to other folks via email or messages, for example. In those cases, though, you’ll still be making a copy of those documents that your contacts will edit independently. But beyond that, it’s probably not wise to hold your breath. Apple didn’t specifically discuss any multi-party collaboration features during its keynote, which suggests that the only place you'll be able to get those features will continue to be in iWork for iCloud, for now. But, hey, it gives you something to put on your iOS 9 wishlist. Did my ears deceive me? Will AirDrop really work between my Mac and iOS devices? It was on many of our wishlists, and we’re pleased as punch that it’s come true: AirDrop will now work between iOS devices and Macs, meaning you can exchange files on an ad hoc basis between the two, without the need for an Internet connection or even being on the same local network. Need to get a photo to your Mac from your iPhone? Fire up AirDrop. Want to send that PDF from your Mac to your iPad? Same thing. And you can also limit your sharing so that only your iCloud contacts can see your share requests. Will Mail Drop count against my iCloud quota? Let’s back up: If you missed it in the barrage of news yesterday, Mail Drop is Apple’s new iCloud service for sending large attachments (up to 5GB in size). Apple will avoid mail-server bottlenecks by uploading those attachments to iCloud first, then downloading them to your recipients from there. As for whether those uploads will count against your quota, we don’t rightly know. But if they’re going to offer support for 5GB attachments and also provide you with 5GB of free iCloud space, we certainly hope not. Will older versions of OS X be able to use iCloud Drive? 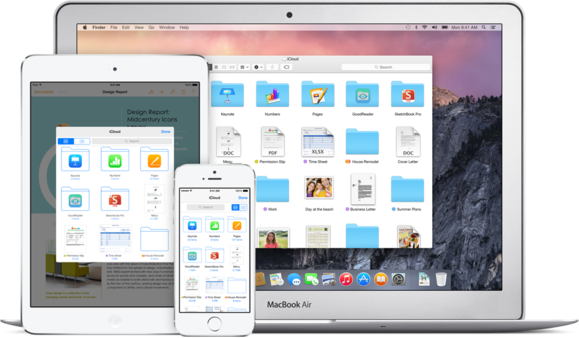 What about iCloud Drive-enabled iOS apps under iOS 7? Again, our Magic 8-Ball says “Reply hazy.” But if we had to guess, we’d imagine that iCloud Drive will require iOS 8 and OS X Yosemite. (Apple’s page on iCloud Drive certainly seems to confirm the latter, while the fine print says only that “some features” require iOS 8 and Yosemite.) Apple’s never been shy about enticing developers and users onto the latest versions of its software through its offer of new features. 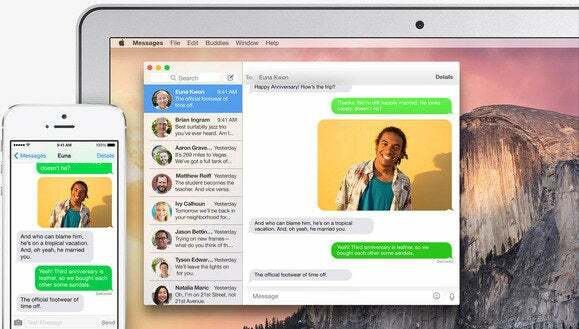 Getting SMS messages on your Mac is just one new perk of Apple’s Continuity. So what’s the deal with Continuity? Many of us own more than one Apple device these days. While iCloud already helps us keep some information in sync between those devices, the process of switching back and forth between them is still often rough. 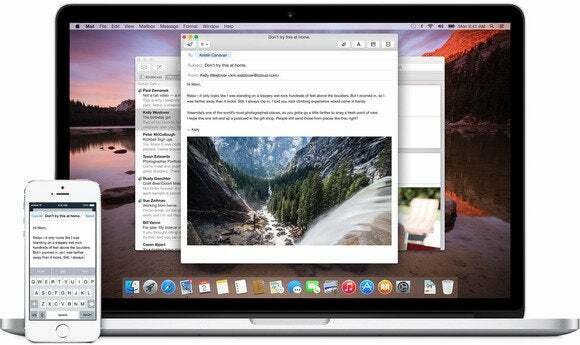 Continuity aims to help smooth it out: If you start writing an email on your iPhone, you'll be able to pick it up from the same exact spot on your Mac. In the middle of reading an interesting article on your iPad when you need to head out the door? You'll be able to open up your iPhone and keep reading, right from the same scroll position. That’s all just one feature, which Apple dubs “Handoff.” Continuity goes beyond that, by making your devices aware of each other in different ways. For example, when your Mac doesn’t have a Wi-Fi connection, it will be able to automatically join a cellular hotspot created by your iPhone. Calls to your iPhone will ring on your Mac; SMS messages—that’s right, not iMessages but those from your “green bubble” friends—will appear on your iPad and Mac; and you'll be able to initiate calls and texts from your Mac as well. That Handoff feature is pretty cool, but is it only limited to Apple apps? Nope, third-party developers who want to take advantage of Continuity will have that option. Apple is providing a framework for developers who want to have their apps talk to each other on iOS and the Mac. Obviously we’ll have to wait to see what kind of clever ideas developers come up with to get the most out of this functionality. Third-party apps will be able to take advantage of the Handoff feature Apple demoed. Most users won’t really see the direct implications of CloudKit: It’s a developer-facing tool that makes it easy for them to create a server-side app to support their iOS or Mac app. So, for example, if a third-party app requires something like push notifications, Apple will now provide an out-of-the-box system for supporting them, along with a data store and more. Basically, CloudKit will make it easier than ever for app developers to create complex client-server interactions, which in turn means better reliability and consistency for end-users. What else will iCloud be used for? Here’s the thing: There are a lot of places where iCloud is clearly key to a piece of technology—some of the Continuity features Apple demoed, for example, work only when you’re logged into iCloud on all your devices. Over time, Apple has come to rely more and more on iCloud as the unifying platform for its devices, starting with Messages and FaceTime and continuing in iOS 8 and OS X Yosemite as the two operating systems work together seamlessly. Sometimes the use of iCloud in those features isn’t explicit. But it’s clearer than ever that iCloud will be a crucial link in Apple’s ecosystem.